I enjoy a mindfuck of a movie as much as the next guy, so when I heard that the ending to Enemy was a big love-it-or-hate-it, gasp-inducing, cower-in-fear-or-laugh-out-loud affair, I just had to see it. And I have to say, it is quite the shocker. However, it is also a big part as to why Enemy doesn’t work. I won’t spoil it here, except to say that my reaction fell more towards “whatever” territory. The story follows a college professor (Jake Gyllenhaal) who one day discovers he has an exact double (also played by Gyllenhaal) who’s his polar opposite. Whereas the professor is soft-spoken and timid, the double is a confident, abrasive small-time actor. After what seems like an eternity of overly dramatic pauses and piss-yellow color correction, the two men meet, distrustful of each other, trying to figure out how this could be. Are they twin brothers, or the same person with split personalities? 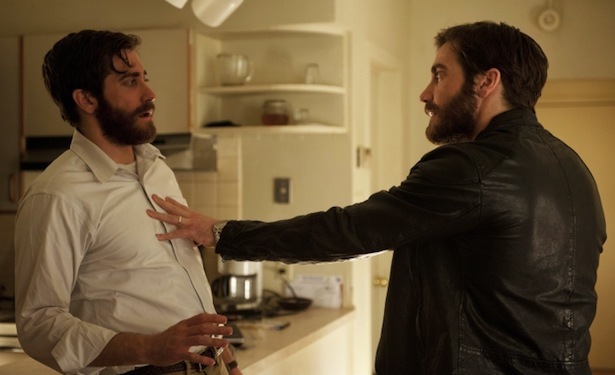 Enemy is a languid thriller that falls prey to its own art-house pretensions. There are plenty of spider references, meant to portray… something. The webs of our identities? Of our relationships? Of our lives? Who knows. Perhaps a better question is, who cares? Sometimes not fully understanding a film is a good thing, but here the attempt feels too tentative, as if director Denis Villeneuve didn’t know whether to emulate Alfred Hitchcock or David Lynch. By the film’s final creepy-crawly twist, it seems like Enemy is hiding layers of meaning under its surface. And I don’t doubt the filmmakers believe that. But they broke one cardinal rule: You have to make the audience care.